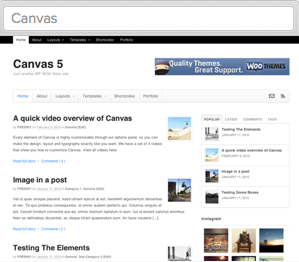 The Canvas theme by Woo Themes is what this site is currently using. Out of the box Canvas is pretty plain but the good news is that it is quite simple to make customizations to it (even if you are not a coding queen). One of the quick changes that I made to WP Queen was moving the top navigation from the default left position to the right hand side. This short video shows you how to move the navigation to the right hand side on the Canvas theme and the code used is below the video. One of the other things that I wanted to change on the Canvas theme was the avatar image on the author profile and comments area. By default the image is round but I prefer the more traditional square avatar image. It’s quite simple to change the default avatar image to square with a little css. This short video shows you where to paste the code to make the customizations and the css code used is below the video. The other change that I wanted to make was to display the social media icons in the navigation menu line. This is an easy customization to make. All you need to do is copy and paste the shortcodes that Woo already provides for you. The Woo Short Codes can be viewed here. These little customizations don’t take long at all to do and are easy to do even if you are unfamiliar with any type of coding.